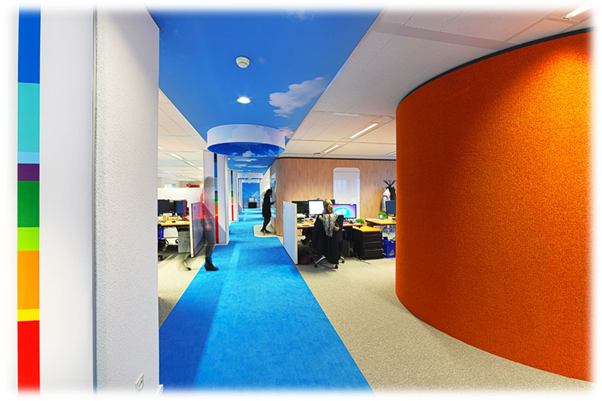 Ever wondered how offices will look if you painted the walls with bright reds, deep blues & intoxicating indigos? That day isn’t far!! This time we’ll show you some stunning ways you make your office walls your colouring book & stun people. First of, select some colours, patterns & decide where to put them! Asian paints, Dulux & many other companies provide apps for doing the same. Or you can visit their outlet & ask for their expertise!!! So now you know the insider tricks for choosing the perfect colour without actually putting on the colour [for those of you who didn’t know] it’s just a click away!! The look that you would want to adopt in your office is entirely up to one’s choice depending upon – kind of work that happens, people who work etc.! Why I’m mentioning this is so that you don’t interchange colours! For instance, if you paint up a rainbow in your conference room it may become more of a casual place & the purpose of having a segregated room is lost! Let’s check out some design ideas…..make mistakes & learn of course!! Try using some patterns in the colours!! This will make having colours even more fun! Let your space define your colours & interiors derive patterns out of them…. 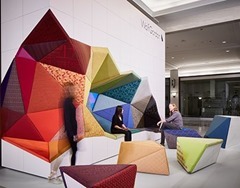 #RAINBOW_OFFICES ** imagine working in such spaces!! <3 Work is going to seem fun & you will be charged all day round! Note- notice how the area of work-desks is in some sober colour & only ‘non-work spaces’ have been coloured? This is because bright colours can distract people while trying to concentrate. you can still manage to blend it in with the colourful exteriors to make it seem ‘LESS WHITE’! 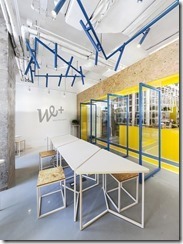 This entry was posted in Architect's Pick and tagged colour, design, interior, interior design, office. Bookmark the permalink.